Benefit Auction Raises 114,000 Euros With All Proceeds Donated to the Hammer Museum in Los Angeles. Ornellaia's Vendemmia D'Artista Project Has Now Donated More Than 1.5 Million Euros to Art Foundations Across the Globe. Ornellaia, one of Italy’s iconic estates, is proud to announce the fulfilment of the 8th edition of Vendemmia d’Artista, a project that showcases the marriage between the world of contemporary art and fine wine. On May 19, Ornellaia held an exclusive benefit auction at the Hammer Museum in Los Angeles, which included nine special-edition bottles created by Japanese artist Yutaka Sone to capture the essence of Ornellaia 2013 ‘L’Eleganza’ (Elegance). The auction took place as part of a gala dinner during which Andrea Fiuczynski, EVP/Chairman, Sotheby’s Americas, oversaw the bidding. The auction raised over $128,000, with all proceeds going to the Hammer Museum in Los Angeles. The auction proceeds will benefit the museum’s exhibitions, collections, and nearly 300 annual public programs, all of which are free to the public. 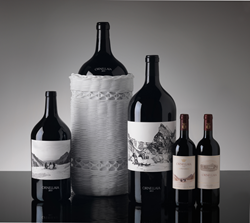 To interpret the unique concept of L’Eleganza, Yutaka Sone created a site-specific work of art that is now part of the Ornellaia estate’s contemporary art collection, and exclusive bottle labels, individually signed, that went to dress the 109 large-size bottles of Ornellaia: 100 3-liter double-magnums, 8 6-liter Imperials, and a single 9-liter Salmanazar. In addition, he created a special 750-ml bottle of Ornellaia that will be included in every six-bottle wood box. Launched in 2009, Vendemmia d’Artista celebrates the unique character of each new vintage of the estate’s flagship wine, Ornellaia, by commissioning an artist of world fame to interpret a theme chosen by the estate and Vendemmia d’Artista art curators Bartolomeo Pietromarchi, Director of the Maxxi Museum in Rome, and Maria Alicata. To date, the project has raised more than 1.5 million euros and donated the entire proceeds to foundations and museums across the globe that support art across the range of its expressions, including the Whitney Museum in New York, the Neue Nationalgalerie in Berlin, the Royal Opera House in London, and the H2 Foundation in Hong Kong and Shanghai, as well as the Museo Poldi Pezzoli in Milan, the AGO in Toronto, and the Beyeler Foundation in Basel. On June 23rd, the Italian Embassy in Tokyo will host a celebration in honor of the 150 years of diplomatic relations between Japan and Italy, during which the Ornellaia 2013 ‘L’Eleganza’ bottles will be introduced and exhibited. “When I began this project, and as I have worked with marble all my life, I knew exactly where I needed to go to interpret L’Eleganza of Ornellaia 2013 vintage,” stated Yutaka Sone. I decided to visit the marble quarries of Carrara where Michelangelo used to take the stone for his celebrated sculptures. My two dear friends, Luc Tuymans & Rirkrit Tiravanija, accompanied me on this special journey and together we enjoyed a picnic in this magical place, high in the mountains, surrounded by the pure white marble cliffs facing out to the sea and beyond. For me this place epitomizes the sublime elegance of nature and it inspired me as we shared food, great wine, conversation and our close friendship. As you see from the labels I have created, I wanted to interpret the values of sharing, of friendship and the extraordinary uniqueness of this experience. “The Hammer Museum is thrilled to partner with Ornellaia, Sotheby’s, and the renowned artist Yutaka Sone to present this collaboration. We are honored that Ornellaia selected the Hammer to benefit from the wine auction this spring,” said Ann Philbin, Director of the Hammer Museum. Ornellaia’s philosophy considers the birth of the wines to be the truest expression of their terroir. The grapes for Ornellaia are selected by hand, and picked in the estate's vineyards in Bolgheri, on the Tuscan coast. The varying natures of the estate's terroirs, marine, alluvial and volcanic, are ideal for the cultivation of Cabernet Sauvignon, Merlot, Cabernet Franc and Petit Verdot. The Estate extends over 97 hectares along the Tuscan coast, just a short distance from the medieval hamlet of Bolgheri and the famed cypress-lined avenue ‘Viale dei Cipressi’. The constant work of the Ornellaia team and the ideal microclimatic and geological characteristics have brought the wines great international success in just twenty years since the first vintage of Ornellaia in 1985. In 2001, the 1998 Ornellaia was declared Wine of the Year by the American journal Wine Spectator. In 2011 the German publication Der Feinschmecker awarded Ornellaia its most sought-after award, the ‘Weinlegende’. Ornellaia has received considerable recognition in the national and international press, and is consistently ranked among the top estates by Wine Advocate, Wine Spectator, James Suckling, Antonio Galloni, Bruce Sanderson and the Italian Wine Guides: Gambero Rosso, Espresso, Veronelli, Duemilavini AIS, and Luca Maroni. Admission to all exhibitions and programs at the Hammer Museum is free, made possible through the generosity of benefactors Erika J. Glazer and Brenda R. Potter. Folio Fine Wine Partners was founded in 2004 by Michael Mondavi and his wife, Isabel, with their children, Dina and Rob Jr. Folio is an importer, fine wine agency and producer of quality wines from the world's premiere and emerging wine regions, providing sales, marketing and public relations services to wine brands from California, Italy, Austria, Germany, Spain and Argentina. Wines from California include Animo, Emblem, Hangtime, Isabel Mondavi, M by Michael Mondavi, Oberon and Spellbound. From Italy, are the wines of Attems, Bruno Giacosa, Coppo, Dal Forno Romano, Danzante, Donnafugata, Marchesi de’ Frescobaldi, Luce della Vite, Masseto, Ornellaia, Quorum, and Villa Sandi. The Spanish portfolio includes Artadi, Capafons-Ossó, Fillaboa, Leda, Nita, Palacios Remondo and Vall Llach. From Argentina are the wines of Ben Marco, Crios, Nosotros and Susana Balbo, with Laurenz V (Austria), and Prinz von Hessen (Germany) completing the portfolio.